Holistic Health is not itself a method of treatment, but is an approach to how treatment should be applied. The goal is a wellness that encompasses the entire person, rather than just the lack of physical pain or disease. It is often used in contrast to the medical model that focuses on treating symptoms and syndromes without attempting to address functioning beyond the absence of disease. The holistic approach focuses on the cause. The holistic approach offers individuals the opportunity to be the creators of their own reality of health, thru an understanding of all levels of health and a balanced lifestyle. Functional medicine was pioneered by Dr. Jeffrey Bland Ph.D, a nutritional chemist. In functional medicine the presence or absence of disease is secondary to the understanding of the function that prevents disease or the dysfunction that allows a disease to occur. Often times by correcting the function with simple nutritional and lifestyle changes or possibly supplementation, the disease state can be avoided. Conventional medicine has little to offer in the treatment of function. Sometimes a simple correction of diet, proper supplementation, or some lifestyle change can produce dramatic improvements in symptoms more effectively than drugs. Moreover, when prescriptions or over the counter drugs are used to try to suppress the symptoms in a case where no disease process is occurring, they tend to produce side effects and sometimes these side effects can be life threatening. The body works as a whole and is a process always striving for homeostasis, an ideal internal state of balance. Unfortunately health care today has become nothing more than disease management. It is our hope and desire at Holistic Nutrition to promote an awareness of wellness that takes a functional approach to preventative good health. Rather than alternative medicine, perhaps we can take a rational approach to medicine, which combines the best of both conventional medicine and alternative methods of treatment. Chronic disease is on the rise in the 21st century. At the root of all chronic disease lays nutrient deficiency. This can either be lack of certain food groups or an inability to digest and assimilate the nutrients from the food we eat. Nutrition is at the core of all wellness and is one of the pillars of good health. Whole foods free of harmful preservatives, dyes and chemicals will give us what nature intended, a vibrant and healthy life full of energy and optimism. In order to achieve these goals we must be aware that harmful chemicals exist. These chemicals pollute not only our environment, but what we eat and what we put on our skin. Health Canada has stepped forward to ensure the safety of all nutritional supplements available to consumers by invoking Bill C-6. This bill requires all manufacturers of nutritional supplements to have a Natural Health Product number (NPN) in order to be sold in the Canadian market place. At Holistic we have meticulously researched and sourced all of our health care products. We want to ensure that all supplements, homeopathics and botanicals have passed the testing requirements of Health Canada and are on track to receive their NPN numbers. With this in mind we have selected only top notch research based Canadian companies, who are in full compliance with Health Canada. This safety net has unfortunately not yet found its way to the cosmetic and skin care sector. It is up to consumers and retailers alike to be their own advocate for the safety of these ingredients. At Holistic we hope to ease that burden on the consumer by reviewing all product ingredients before placing them on our shelves. 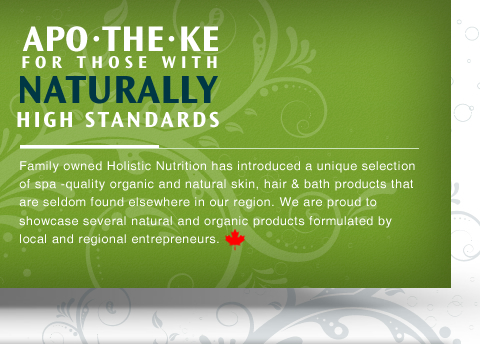 We have created a checklist of what our products do not contain.